DN-AE04 is a computer controlled electronic load designed for the characterization of high current devices such as large solar cells, fuel cells and batteries. With a maximum design current of 20 A (DN-AE04H), it far exceeds the capabilities of all but the most powerful (i.e. expensive) source measure units (SMU), while remaining at a fraction of the cost of such instruments. 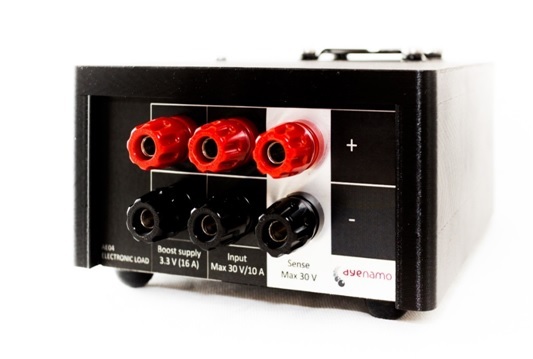 By integrating a powerful 3.3 V boost power supply in the instrument, zero-voltage operation is conveniently enabled without the need of additional equipment. Despite the high current handling capabilities, the instrument has a very compact footprint of 15 x 10 cm and can be powered directly from the USB-port, making it highly portable. 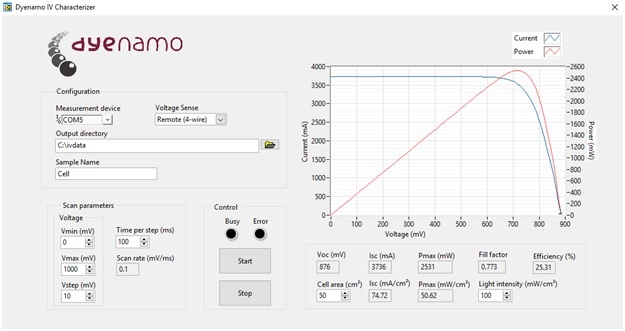 The instrument also comes with a user-friendly software package for solar cell characterization by I-V curve tracing, MPP tracking and many more methods. Software for other applications (batteries, fuel cells, solar fuel and more) is under development. Contact us for more details!